Policy Watch Weekly Update is a publication of the Kansas Rural Center with sponsorship from the following: KRC’s Policy Watch partners: League of Women Voters, Kansas Natural Resource Council, Kansas Farmers Union, Climate and Energy Project, and Audubon of Kansas. Visit KRC’s website to read about the recent activities of the Kansas Legislature. Other new transparency measures are in place. In an important move, committee minutes must now reflect the name of the person who introduces each new bill. Concerned about an issue or a bill? Call the KS toll-free legislative hotline at (800) 432-3924 and leave a message for your state legislator. Calls are answered by librarians at the State Library of Kansas, and all conversations are confidential. The hotline is available weekdays 8 a.m. to 5 p.m. You will be asked for your name, your address (so they can find your legislator), and your brief message. You can also text questions to 785-256-0733 or instant message at Ask-a-Librarian. These experienced research librarians will also answer your questions about legislation, legislative procedures, and state government. In a MIT study of the November 2016 election, Kansas ranked 47th Voter Registration and 48th in Voter Turnout! Click here if you’d like to print your own postcards. The Salina League is always looking for members who can help. Could you sit at the postcard table on Saturdays sometimes? How about helping with a voter registration table this year? See more opportunities at “Meet the League”. If you are willing to give an hour, please Contact Us. 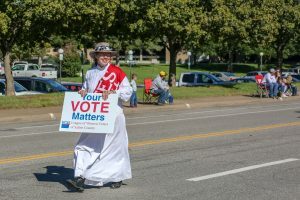 Check out the April issue of our newsletter, “The Voter.” Each issue includes updates on events and activities, volunteer opportunities, items of special importance, and more. Come Enjoy Lunch and Learn! The public is welcome to the League of Women Voters free Lunch & Learn, on the second Tuesday of the month (September-April), 12:15-1:15pm, Salina Public Library’s Prescott Room (downstairs). All are welcome to bring a lunch and eat during the presentation. Questions and discussions are welcome as well. Lunch & Learn happens three months of the fall semester and three months in the spring. See our Calendar on the events page for dates and details. AND IF YOU MISS THE LUNCH AND LEARN SEE THE VIDEO. The LWVK reaffirms its position that adequate and equitable funding of public (pre-K-12) education is very important for the students currently enrolled in Kansas schools, as well as for the future of Kansas, its communities, and the state’s businesses. Read all of LWVK position statements in full.